I absolutely adore fudge for the holiday season. My mom’s fudge, especially. It’s a little bit of work, since it involves cooking the sugar to the soft ball stage, but it’s SO worth it! It’s really the only fudge I knew for a long time, but one year at a Christmas potluck, I tried microwave fudge. It’s not the same texture as regular fudge, but it’s still delicious! This fudge only takes a few minutes to cook in the microwave, and then you just have to pour it out in a pan and let it chill in the fridge for a couple of hours before serving. The original recipe just calls for semi-sweet chocolate, but since I adore Hershey’s Pumpkin Spice kisses (I’ve seen them at Target and Walgreens out here. ), I just had to swirl these two together. Because of the pumpkin spice kisses (which are usually softer than regular chocolate at room temperature), I recommend serving these just out of the fridge. As the fudge sits out, it doesn’t melt, but it does get fairly sticky. Line an 8×8 or 9×9 inch baking pan with parchment paper. Lightly spray the parchment paper with cooking spray and set aside. Place the pumpkin spice kisses and 9 oz. of the condensed milk in a medium bowl. Microwave the mixture on 50% power in 30 second increments, stirring well after each microwave cycle, until melted. Stir in 2/3 tsp. of the vanilla extract and set aside. In another bowl, add the semi-sweet chocolate chips and the remaining 5 oz. of the condensed milk. Microwave the mixture on 50% power in 30 second increments, stirring well after each microwave cycle, until melted. Stir in the remaining 1/3 tsp. of the vanilla extract and set aside. 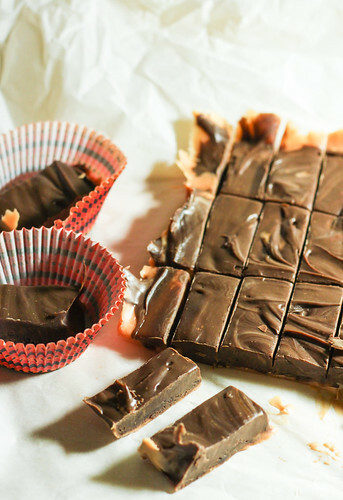 Spread the pumpkin spice kisses fudge into the bottom of the lined baking pan, and then drizzle the semi-sweet chocolate fudge over the pumpkin spice fudge. Swirl the two together with a fork or butter knife. Refrigerate the fudge for 2 hours or until the fudge is firm. Lift the parchment paper from the pan, and cut the fudge into 48 equal pieces.